About 0.33 percent of Switzerland’s population are Buddhists. 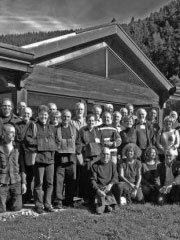 In 1978 the Swiss Buddhist Union (Schweizerische Buddhistische Union / Union Suisse des Bouddhistes / Unione Buddhista Svizzera) was founded by the Czech Buddhist Mirko Fryba (Bhikku Kusalananda). The SBU sees itself as an umbrella organization of the various Buddhist communities in Switzerland and does not represent a specific Buddhist school. It is open to all Buddhist beliefs and traditions based on «Buddhist values.» The SBU is a member of the European Buddhist Union. The German Buddhist Nyanatiloka was an important early Buddhist in Switzerland, who planned to found a Buddhist monastery in Switzerland. The writings of Swiss psychologist Carl Gustav Jung have many allusions to Buddhism. Max Ladner founded a Buddhist group in Zurich in 1942. In 1948, Ladner published the Buddhist journal «Die Einsicht». Geshe Rabten Rinpoche founded in 1977 in Mont-PĂ¨lerin a Buddhist monastery and study center for European monks. There are also Tibetan-Buddhist and Zen monasteries in Switzerland.